What do dogs think? Try thinking like a dog to find out. I admit it. I am one of those dog owners. By those I mean, I talk to my dog, take him for rides, buy him ice cream, consider his feelings, and in short, treat him pretty much as you might a furry four-legged child. And of course, my child is brilliant. But as my friend and housemate, and dog person himself reminds me, the average dog has a brain about the size of a golf ball. Fearing there was some dreadful mistake, I scurry to my computer, only to find that he was, in fact, right. But the area of a dog’s brain that is dedicated to olfactory processing is huge and much more complex than ours, he assured me. What’s that? Some kind of lame consolation prize? 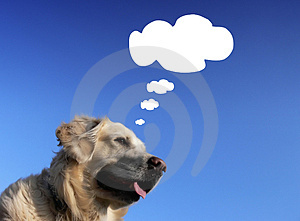 Because for dog owners like me, their dogs’ ability to solve problems, understand their owners thoughts and response accordingly, and outwit any attempts to train them in a direction that they themselves do not want to go, is proof positive of the advanced thought processes that go on in their canine cranial cavity. So do dogs think? And if they do, what do they think about? Maybe a better way to address these questions is to try and think like a dog. Dog-trainer/behaviorist William E. Campbell gives the following example: Dinner’s fast approaching and your dog, Ella, is gazing at you with limpid eyes. She’s wondering when her dinner’s going to be ready you think. What Campbell says is more likely is that all that tail wagging and rapt attention is designed to get you to do and say the things she knows will lead to the actual procurement of dinner. Like you asking her “you want your dinner too, don’t you?” She’s also probably practicing her shtick in the room she’s found to be the source of the magic repast – the kitchen. So, if Ella’s brain isn’t saying “I want my dinner” – what is it doing? The second thing we need to do, says Campbell, is get rid of the idea of language being involved in a dog’s thoughts. For example, if you were suddenly thrust into the middle of Tokyo, you might understand a great deal about what’s going on around you without understanding one bit of the Japanese language. Eventually you might figure out what some of the words mean. But because dogs lack the vocal ability to speak our language, the limit of our dog’s language learning is the meaning of the sounds of certain words. Luckily, says Campbell, dogs are very quick to learn the sounds that are important to them. Just as our minds are full of the images, smells and sounds we’ve heard throughout life, dogs process images in their mind through their senses. If the mention of elementary school transports you back to the smell of the chalkboard, the sound of the school bell, and the feel of the wool in your school uniform, you probably have some idea of how your dog experiences the world. These are just a few examples of what may go on in the average dog’s head. But as any true dog lover will tell you, my dog is far from average. Fascinating article – well written and very informative. I love your casual style! As a completely new puppy owner I welcome all the guidance listed here. I really want my puppy to be well trained and have a wholesome atmosphere to live in. I am grateful for the information and facts.